Narayani Impex office wide range of Thermocouple Tips also called Temperature tips. Thermocouple Tips are used for the measurement of molten metal temperatures in furnace, ladles, converters in steel plants and foundries. Backed by the support of our talented professional in this domain, we have been able to bring forward a qualitative range of Disposable Thermocouple Tips. With firm commitment to the quality, we are engrossed in presenting optimum grade Disposable Thermocouple Tips. b. M. D tips can be used 6 to 8 times to measure temperature of molten metal in slag free condition. 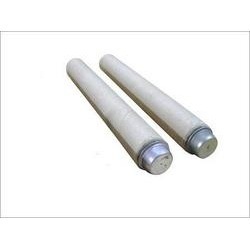 expendable card board sleeve tips are used to measure temperature of molten metal with slag. We are involved in offering a wide range of Thermocouple Tips to our most valued clients. Our range of Thermocouple Tips is widely appreciated by our clients which are situated all round the nation. We offer our range of Thermocouple Tips at most affordable prices. Dimension: 18MM ID & 30MM OD. LENGTH 300MM. This is an immersion type portable battery operated temperature measuring system for molten metal with wireless communication for auxiliary display, computer, printer.